Earlier this week we went to South Carolina to look at the house, pick interior colors, choose light fixtures and talk to our landscaper. The house is really coming along quickly. The Hardie plank is on, the roof is shingled and they are ready for the stacked stone to be applied to some of the front areas. We walked through the house with the electrician to get a count on how many lighting fixtures were needed, the walls look like they are filled with spaghetti before the insulation and sheetrock. Our contractor and his subs are really nice folks and very easy to work with. My day was really complete talking to Wyatt, our landscaper. He installed the riprap and is installing a flagstone patio, sod and irrigation, foundation plants, preparing the large (and numerous) garden beds. He and I have gone back and forth with lots of plant material ideas and how to keep a natural look to the garden. 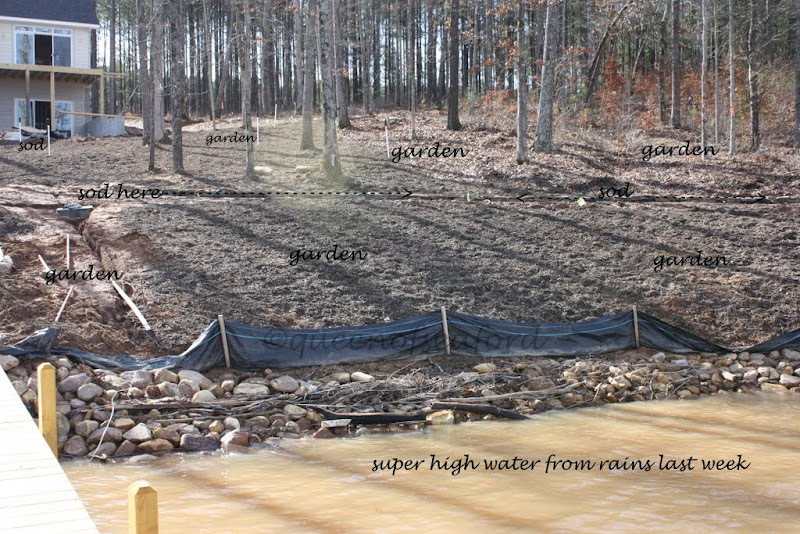 The lot slopes to the water, so we have some tiers and lots and lots of areas under the trees we were able to have as garden beds. There were some beaver damaged trees that needed to be removed. I am happy we were able to keep a good number of trees. The flat spaces are going to be sodded (remember we have three dogs and they need a place to run). The debris along the riprap was washout from upstream. There were some big rains and the lake level rose 3 feet in one day. 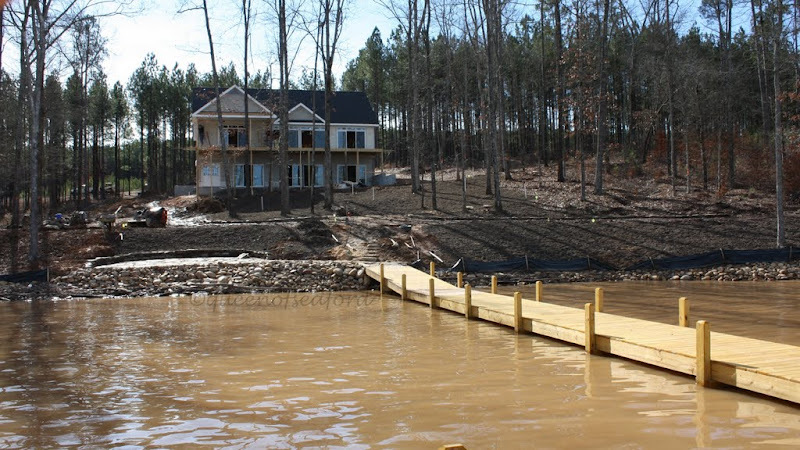 From the dock you can see the house and the landscape coming into shape. 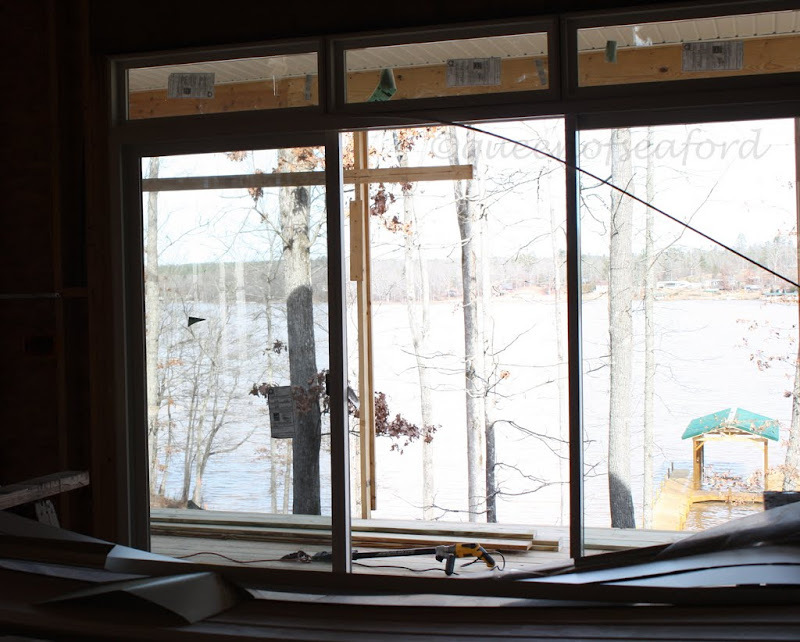 The flagstone patio is at lake level and I think will be a super place to sit and enjoy the lake. 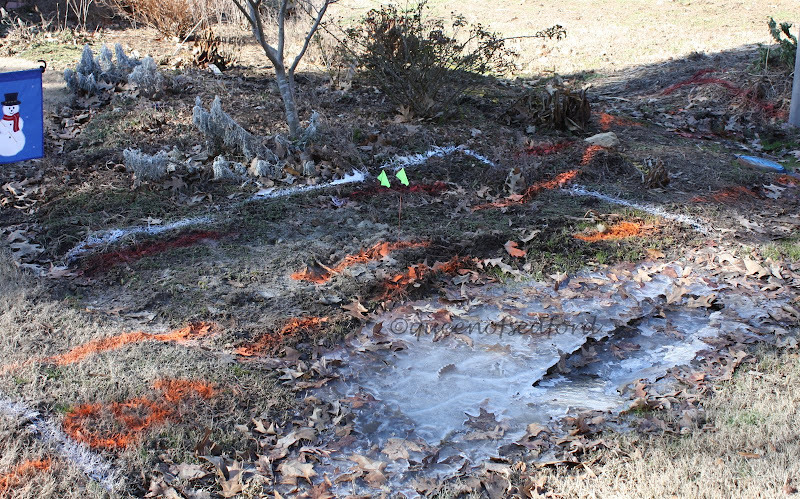 The white sticks are the irrigation pipes with the sprinkler heads. You almost can't see where the grass will be as it is on the level area. The banks along the water are both garden. It is the full sun area I have to garden, most all the rest of the yard is shade or part shade. We are using as many natives or minimum care plants as possible. Deer walk through our yard to get to the lake so that is something we are keeping in mind with plant selection. Flowers and fragrance and foliage color......oh the possibilities!! As we talked with the lady at the lighting store (one of our last stops) we kept a close eye on the weather. The original plan was to get our stuff done then relax for the rest of the day and drive back to Virginia today.....Saturday, you know, the day all the snow and ice plowed through the mid region of the country. We changed our plans and headed up the road midafternoon. After a short stop to see one of our kids in NC for a cup of coffee, we made it home by 10 PM, well ahead of the storm. This morning when we woke the ground was white and when I let the dogs out they loved it! And Newton and Monroe and Skyler were frolicing and having a grand time. Glad we made it home and have no need to go out today. It continues to snow, I think we are about to 10- 12 inches. Did I mention we don't own a snow shovel? Jury is still out with Windows Live, this was done without. The American Holly is a wonderful evergreen tree to have in the landscape. A native tree the Eastern United States, its range is zones 5-9. A mature tree seldom exceeds 50 feet tall with a 15 to 25 foot spread. This pyramidal shaped tree is a slow grower. It can handle some shade though the female tree has a better berry production if planted in full sun. It can be seen as a single or multiple trunk. As others in the Ilex family, this tree is dioecious, having male (staminate) and female (pistillate) flowers on separate trees. The flowers are small and inconspicuous emerging in the spring. For berries to be produced it is recommended for a male tree to be planted within 200 feet of the female. A male tree can pollinate more than one female. (no comment!) The berries are actually drupes. Each drupe contains four seeds encased in a hard shell. The berries are produced during the summer, starting green and turning red as they mature. The berries are a food source for approximately 20 varieties of songbirds, mourning doves, and turkeys. Migratory birds are credited (blamed) for the wide range of hollies. Cattle have been known to eat the foliage. The tree is a shelter for birds and small animals as well as a food source for the larva of the Elfin butterfly. The name opaca means dull, not glossy. 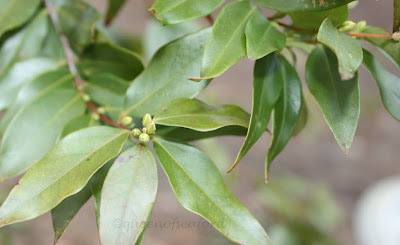 The leaves on the American Holly are a dull dark green with spiny tips on most leaves. There are some leaves that have only the spine on the tip of the leaf. It is alternate, ovate, and evergreen. The holly is used in the United States as Christmas decorations in wreaths, garlands and other arrangements. This can be traced back to the early settlers finding the American Holly similar to the English Holly (Ilex aquifolium) which has been used in Europe for centuries as a symbol of Christmas. The problems (disease and insect) are minimal. There are fungal diseases (remove diseased fallen leaves), chlorosis can occur when the Ph levels are high and Tar spot which appears as yellow spots on the leaves in early summer. Spider mites, leaf miners, and scale can be found infesting hollies. The light grayish brown bark on the trunk is always smooth, no matter the age of the tree. The wood is hard and is used in a wide range of items – piano keys, handles for tools, scroll work, small furniture, inlay work, violin pegs and many other items. More scientific information can be found on the Silvics manual, a resource put out by the Department of Agriculture. If you are interested in a long list of cultivars the University of Florida site has a great list in addition to far more information than I have shared here. MOBOT, Floridata, Virginia Tech, NCState, and Auburn were additional websites used. I read about using Windows Live Writer for blog postings. Jean at Jean’s Garden recently had a post about this. I thought I would give it a whirl and see how I liked it. Windows Live Writer is a free download (I am all for free!!). With Blogger the editing page has such a small window it makes it difficult to see the arrangement of photos with text. I sometimes use MSWord 2007 to publish my posts, you get all the auto correct aides within Word. For some reason I can’t load my photos in Word and have them show up on the blog. With Windows Live I can add my photos directly from my hard drive into the post. 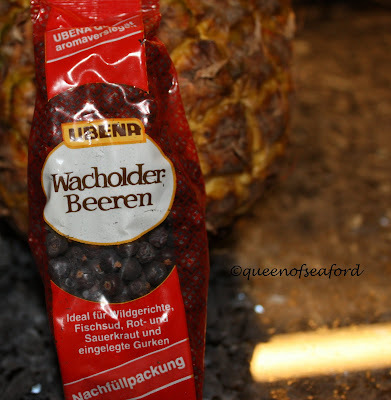 Additionally, if I forget to tag my picture I can add a watermark with my name. The photos can be clicked on to see in a larger screen. I still need to do a spell check but it is easy within WL. I will continue to use my hidden blog to see how the posting looks on the web. I use the same template on my trial blog and I can make additional adjustments if needed. One nice thing about using either WL or Word is I can publish directly and all my hyperlinks are intact. If you copy and paste from a document to your blog editor, the links don’t come along. Have you used Windows Live? Do you like it? What features do you especially find useful? Not sure about using it for every post, but it does have lots to offer. I have only explored a few of the functions. After trying to get the photos lined up within the post I have a bit of a learning curve to conquer. Did Alfred Hitchcock Live In Seaford? I ask this because every winter I feel as though we are living in the movie "The Birds". 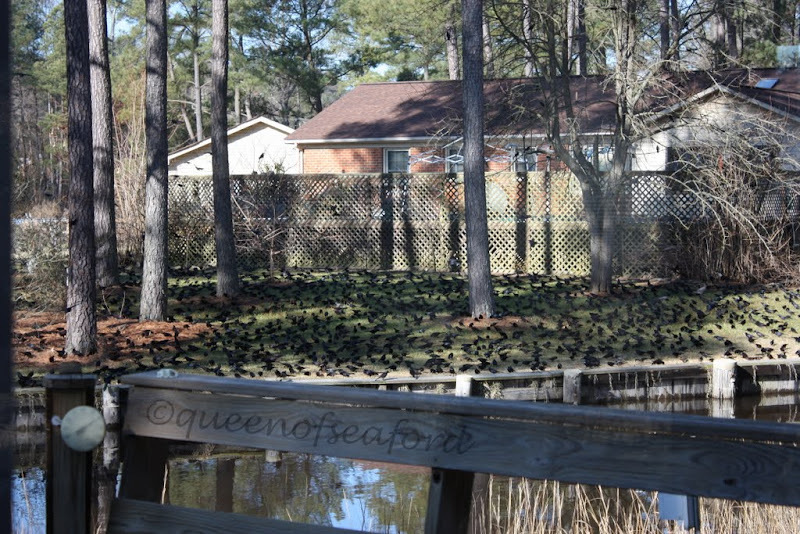 There are huge flocks of blackbirds every winter. When the kids were little we called them 'The Blackbirds of Seaford'. The sound that these flocks make as they land and take off is really loud. It is almost like a distant helicopter taking off or landing. They do like to check out what might be in the feeders. When the blackbirds are around, the feeders usually get emptied pretty quickly. Some of the birds are starlings and some are Redwing Blackbirds. I like this photo as you can see the red shoulders on some of the birds in flight. As always, you can click on any photo to see it in a larger view. 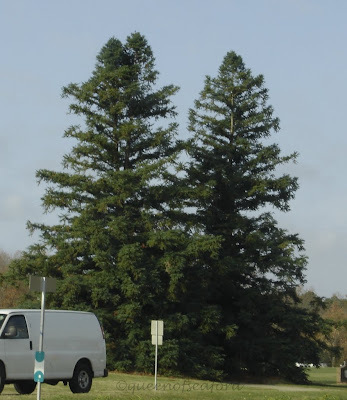 Early in my tree knowledge I saw these two trees along the road on the property of a funeral home and not knowing what kind of tree it was, my first thought was Deodora Cedar….remember this is when I was still learning. A kind fellow Master Gardener and a Tree Steward told me it was a China Fir. Thanks Jackie! I had never heard of this tree prior to that. What a remarkable specimen we have! I did not try to measure the height, but safe to say these are quite large. My very kind husband was agreeable to stop and let me take lots of pictures yesterday. I had one photo from last fall, but had not walked up to the trees to really see them. We painted all weekend so I didn't have a chance to go earlier. The Cunninghamia lanceolate is a native to China, first brought into cultivation in 1701, used as an ornamental in the US in the early 1800's. 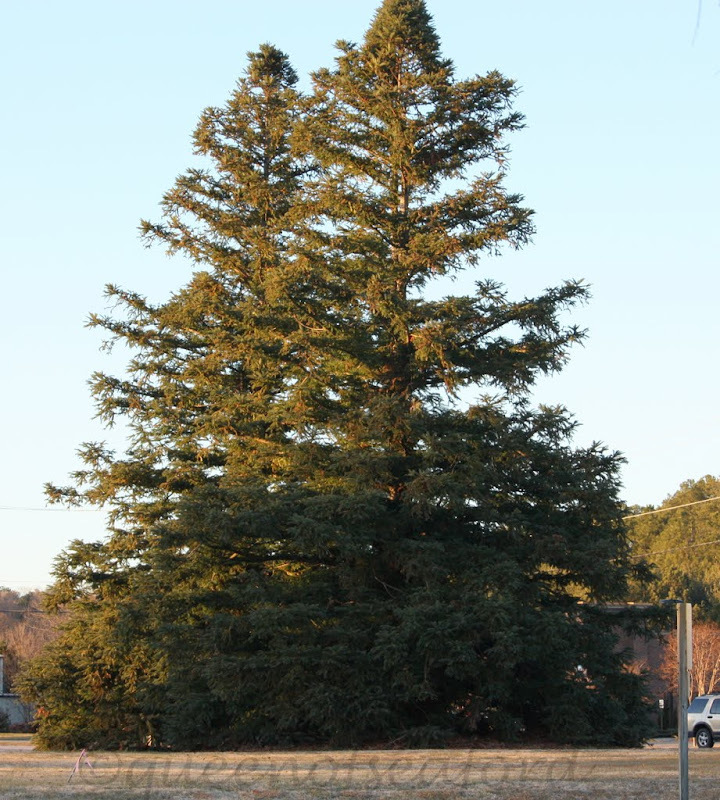 In its native environment there are specimen up to 150 feet tall though in the States most references say they grow to about 75 feet tall with a 20- 30 foot spread. Zones 6- 9 range, part shade to full sun, pyramidal shape with open branching make this tree one to consider in a number of places. It can sucker a bit but it has a straight true leader. It is drought tolerant and can handle a wide range of soil types. 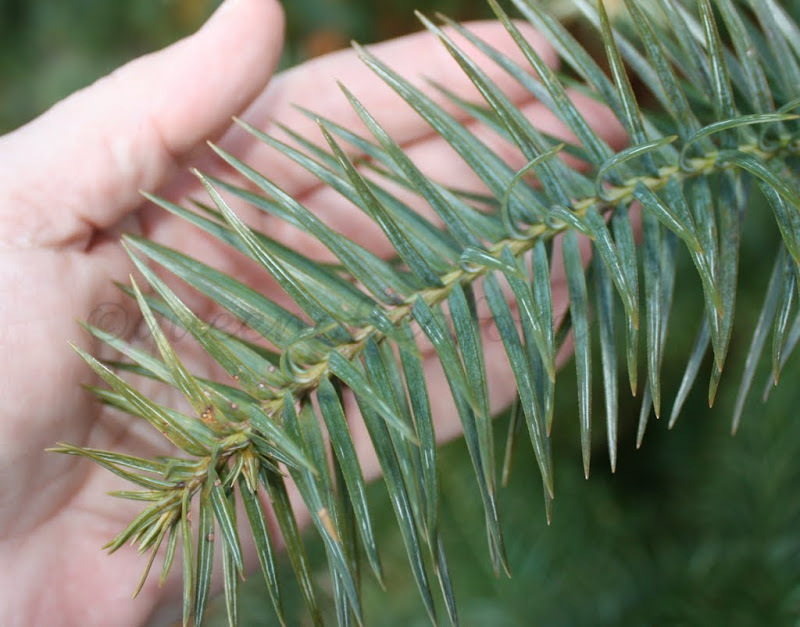 The needles are green, hard, leathery, long (up to 2 inches long) and sharp. They grow in a spiral pattern along the stem. 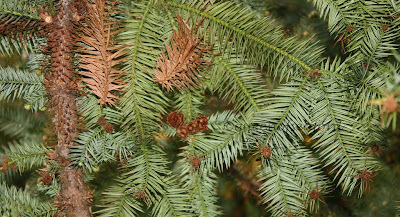 Some older stems turn brown and fall off and are replaced by new growth. 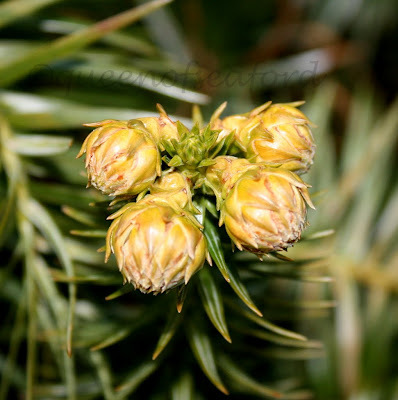 This evergreen is monoecious with small flowers on tips of branches. 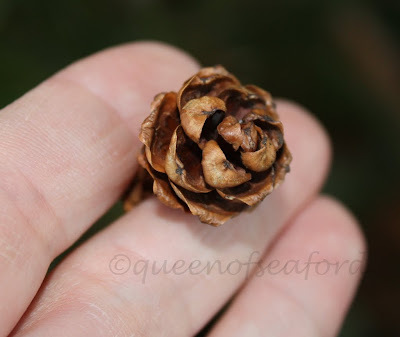 The cones are small and round opposed to barrel shaped like true firs. It is not a true fir but actually in the Cupressaceae family. The chart is on the Greenwood International site is quite helpful. 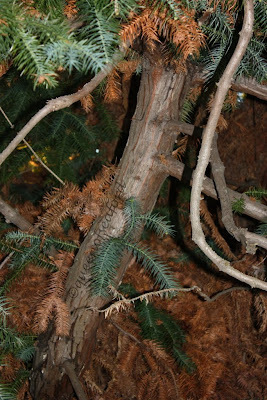 The bark is similar to cedars with the reddish brown shredded look. The timber is used for ship building and home building. The wood is slightly scented and highly prized for use in temples and coffins. While Googling this tree I found a number of sites that offer the timber. 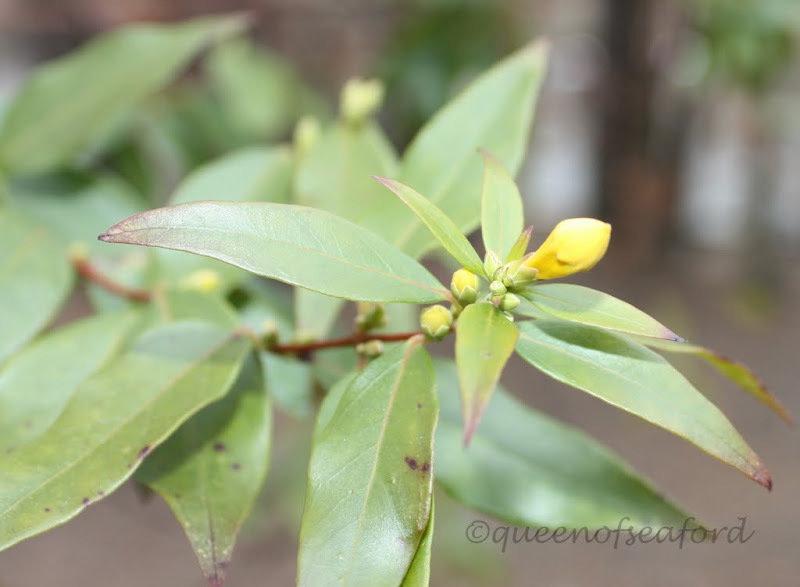 This is winter growth of flower buds. References- Floridata, good write up with a bit of its history—warning of fire prone areas –highly flammable tree with its leaf litter habit! Virginia Tech- good photos in a quick reference sheet. And of course- MOBOT- a great site to use for many plants! Thought I would give everyone an update on the 'color' in my front garden. The county guys came on Tuesday and told me they would be doing the work on Wednesday. 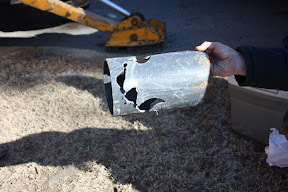 They saved the piece of pipe that had been 'punctured' by another utility...looks more like they broke it! 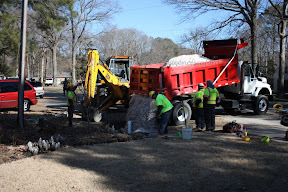 Pipe was cut and repaired, a new cleanout pipe put in, sand, topsoil, seed and straw placed. These guys were really great. I couldn't dig up my bulbs because of the frozen ground. Since they had the big bucket scooper they scooped my bulbs and set them off to the side. How great is that? They also made sure not to grass seed my garden bed area at the end. You can click on each photo to see the enlarged picture. 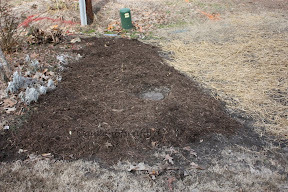 I spent a little time this afternoon putting the bulbs back in the ground and scattered a few seeds that need the cold period. And now for a promise of color for spring...the Carolina Jasmine on the back swingset is full of buds! Today is my birthday and we went out for dinner. Since it was my choice I wanted to go somewhere to get a milkshake. 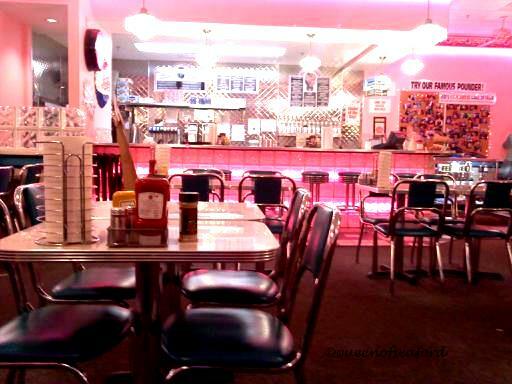 One of the best milkshakes comes from a place called "Cheeburger Cheeburger". Cute place, lots of neon lights, chrome and linoleum furniture and some great onion rings too!! Now I need to loosen my belt. 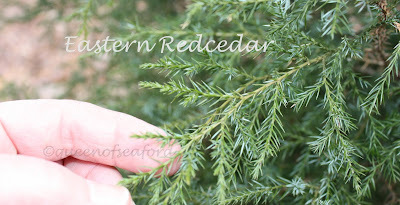 As I prepared to do my posting on the Eastern Redcedar I started in the Learning Garden. I knew we had a few specimen labeled. As I feel I am still a beginner in the tree ID department, I find it beneficial starting with the known. Here starts my trip down the rabbit hole. I took my photos and came home to do more research. Using my reference books I started reading and learning about this tree. The first thing that jumped out at me was the reference to scale like needles……this isn't scale like! Oh no, what was the tree in the Learning Garden? 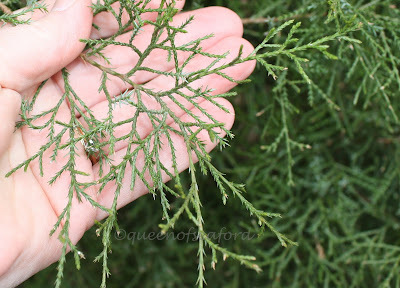 Was it really a Juniperus virginiana? I looked at the Redcedars on my street. 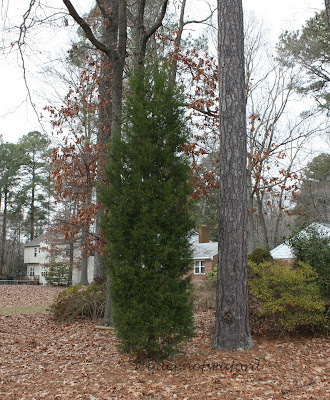 One of these trees had scale like needles….so was this an Eastern Redcedar? The more I read and looked closely the more confused I got. I enlisted Carol while we were in the Learning Garden to look at the labeled tree and then another tree that was close to our Bearded Hedgehog. We investigated both trees (of course they are at opposite ends of the garden) and decided we needed to go over to the Cooperative Extension Office. Using the library in the office we continued to be confused. At one point we thought we had an Eastern Redcedar sample and a Southern Redcedar sample. Finally we read on the Virginia Tech website the following sentence- "Leaf: Evergreen, very small, with two types of leaves (often on the same tree)," The same tree!!! We were looking at the different leaves and getting more and more confused and now we see it is a tree that has two types of leaves. Mystery solved….sort of. 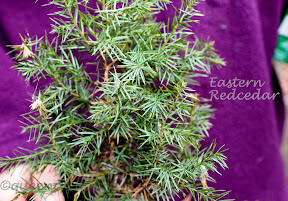 What about the Southern Redcedar? It wasn't until my continued reading online last night that I further learned that the two Redcedars are not always separated, this according to the Forestry Department publication. 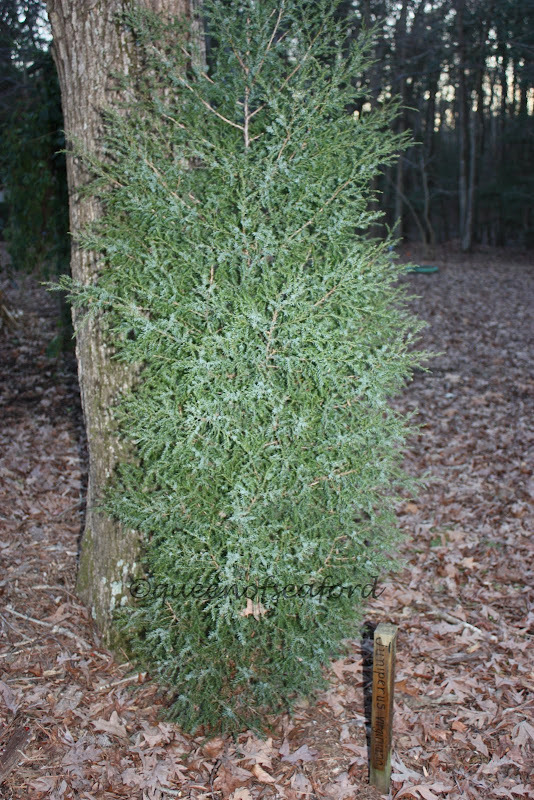 Additionally Oregon State publication says J. virginiana hybridizes with other junipers. So, like some of the oaks, what we are looking at could be a hybrid. 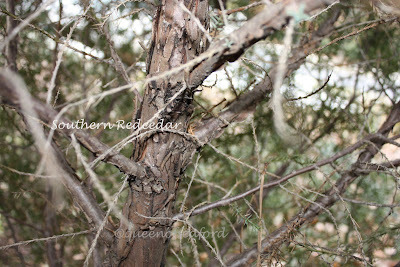 Duke states that there is a debate whether Southern Redcedar, Juniperus silicicola is recognized as a variety of Eastern Redcedar or a full species. 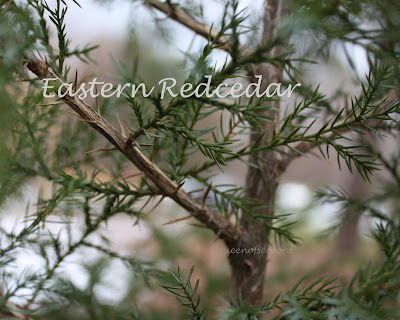 The Eastern Redcedar is a native to North America. It can be found in every state east of the Mississippi River. It can tolerate a wide range of soils and is salt tolerant. The tree is dioecious and is said to reach its sexual maturity in about 10 years. The female tree has the beautiful blue berries. This is a great source of food and shelter for many birds and animals in the woods. The seeds are readily deposited by birds. This tree is hardy from zones 2- 9. It grows on a single trunk to about 50 feet tall, though there are reports of specimen reaching close to 100 feet. It is broad columnar in shape. The bark is quite attractive, rusty brown and looks shredded. Uses of the Redcedar are varied. The wood is used commercially because of its beauty. 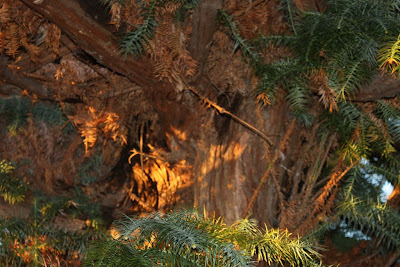 The oil of the cedar wood is used for fragrance compounds. The tree is used for Christmas trees. The berries are used in the making of gin. I use a German cousin to the Juniperus virginiana to make my Sauerbraten, Sauerkraut and other German dishes. Pests on this tree most often noted are the bagworm caterpillars. This can be treated with Bacillus thuringiensis or handpicked. It is recommended that it not be planted near apple trees as the cedar-apple rust can damage the apple crop. The Gymnosperm Database- nice quick reference with information on the oldest specimen found, 795 years old in Missouri. Don't You Have Lots of Color In Your Garden? I have lots of color in my garden at this time of year. I hadn't really planned any of this color....it just happened. The dusting of snow covered it for a while but after the snow melted the color was still there. 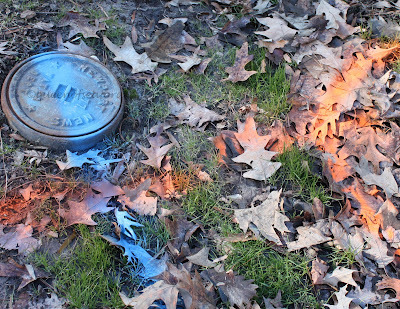 Some really nice blue with the orange. And a large area of flags and yellow, orange, blue, white, and red. 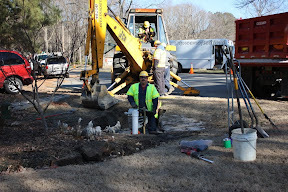 Before we left for South Carolina we had some sewer issues that we thought were resolved. When we returned there were flags. 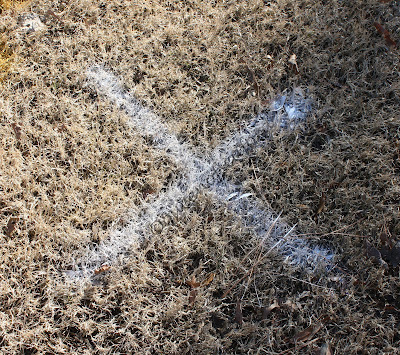 Now we have Miss Utility marking all the utilities. 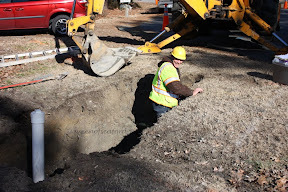 Apparently the county needs to do some repair on the sewer line. 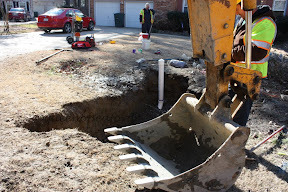 While I am glad something is getting fixed, I do not relish my front garden getting dug up. I went to save some daffodil bulbs inside the white square...the ground is frozen solid. Will keep you posted. 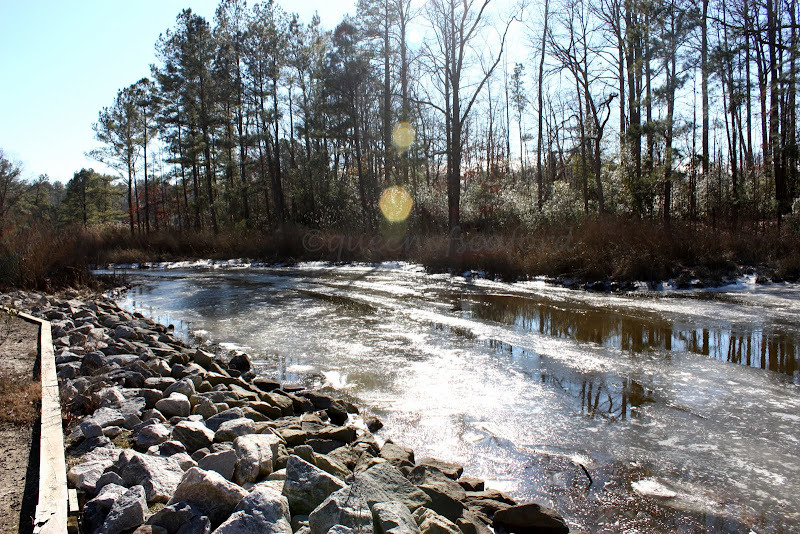 In the meanwhile I will enjoy the scenery out back with the ice sparkles on the creek. This is my entry for Gardening Gone Wild's photo contest this month. The theme this month is 'Winter's Beauty'. Is That A Bearded Hedgehog Or Just A Fun Guy?